Idaho is coached by Paul Petrino, whose older brother is Bobby, the coach at Louisville. But Paul's Vandals — unlike Bobby's Cardinals — have the market cornered on losing. 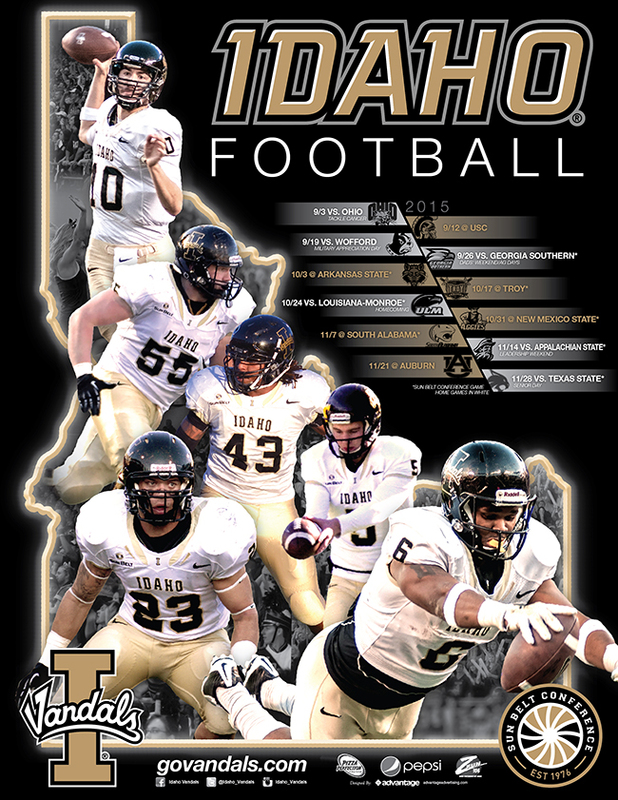 Idaho has won only five games the past four seasons and Paul is 2-21 entering his third season at Moscow. Can we expect this to change in 2015. In a word, no. Poster designed by Advantage Advertising. Idaho mixes the old with the new in its poster, designed by Advantage Advertising. The Vandals are moving to the Sun Belt Conference after spending a year as an independent. The team is coached by Paul Petrino, and if that name sounds familiar, it is. Paul's brother is Bobby, the current Louisville coach who likes to ride motorcycles. The Vandals haven't won a road game since Nov. 5, 2011, and that streak likely will continue in Week 1 when they play at Florida. It was an unsettling 2012 for Idaho. The Vandals fired Robb Akey as coach after a 70-28 loss to Louisiana Tech on Oct. 20, and the team hobbled to a 1-11 season. Then conference reshuffling left Idaho as a team without a league. All football-playing members of the Western Athletic Conference left besides Idaho and New Mexico State and the teams were forced to become independents. The coaching situation worked itself out in December when Paul Petrino, the younger brother of Bobby Petrino, agreed to become coach. In May, the Sun Belt announced that Idaho and New Mexico State would join the league in 2014. Thanks to Nathan. Poster designed by Advantage Advertising. 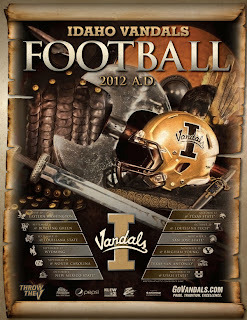 Realistically, Idaho is a team without a conference after the 2012 season. At that point, the Vandals will be one of only two football-playing members of the Western Athletic Conference. (New Mexico State is the other.) 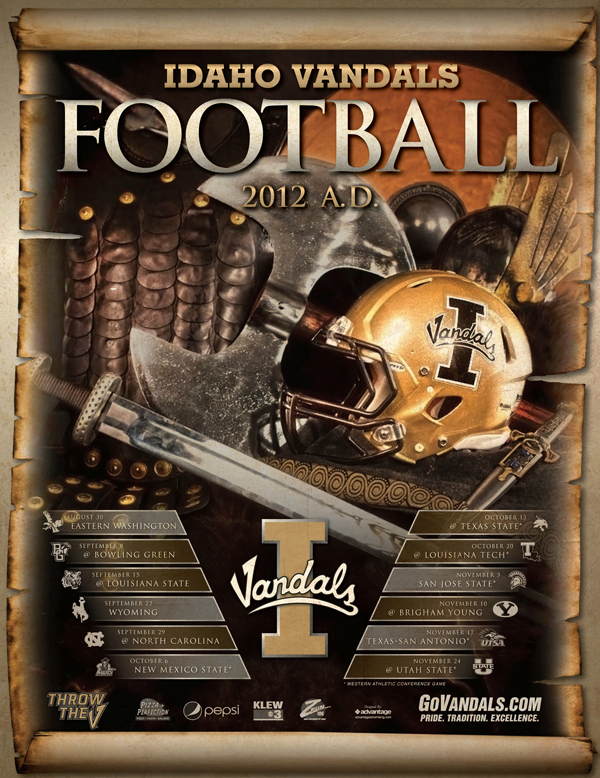 With the WAC likely to go the way of the dinosaurs in 2013, Idaho's best bet appears to be a move to independent status. Click the image to enlarge. Thanks to Nathan. Poster designed by Advantage Advertising.